Next: Spicy Healthy Sriracha Chicken! Previous: Improv Cooking Challenge: Ebony & Ivory = Black & White Cheesecake! 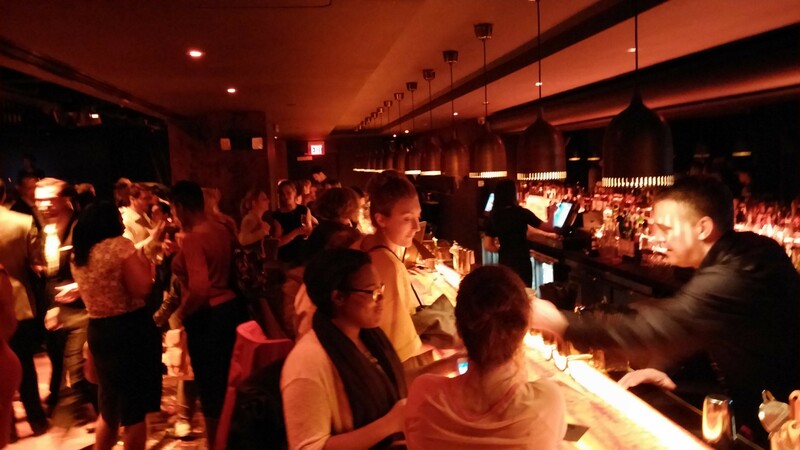 Looking for a fun downtown DC spot for food, drinks, merriment, and a cool atmosphere? This past Tuesday, April 15, Toro Toro had their Grand Opening Party sponsored by the Washington City Paper . Toro Toro is the newest of Richard Sandoval’s collection of restaurants. He has restaurants throughout the US, but those in DC include El Centro (14th Street), Masa 14 (14th Street), Zengo (Chinatown), and Ambar (Capitol Hill). Toro Toro, like the others, is a great, unique spot! Upon entering, you’re welcomed by the hostess stand (and smiling hostesses of course). Beyond there, the restaurant is fairly open with large windows. Part of the kitchen is open too, so you’ll be able to see some of the dishes being prepared. Even with the open concept, there are distinct sections throughout the place. There’s the main dining room, the largest section. Then, if you head towards the upstairs bar, you’ll pass a more relaxed-looking area, furnished with dark wood tables and comfortable chairs. Beyond here, you’ll find bar #1– the upstairs bar. I got my first drink here, a glass of sauvignon blanc. As I sipped my beverage, I headed downstairs to the lounge. Here’s a little in between shot. Above you see the upstairs bar. Below you see the landing for the lounge area as well as the DJ booth. THIS, is a trendy, cool room. The whole thing was lite up with dim, red back-lighting. To the right there is a long bar, which was packed with people. You can hardly see that there’s a bar behind all those thirsty patrons! If you go to the left, you’ll see a few little nooks with round tables and lounge-y seating around them. The lounge was pretty packed. This was an open bar event, so ultimately we decided a close-to-the-bar spot would be advantageous. So, we wound up at a far end of the bar, which was a pretty perfect spot. Not only was it a good place for obtaining drinks, but it also served as a prime location for people-watching. We were able to see down the whole length of the bar. For drinks, the party included beer, wine, and two Toro Toro cocktails, a punch and a sangria. We tried the punch. It was good, but pretty sweet. After that, it was tasty wine for the remainder of the event. Speaking of tasty, I’m sure you’re wondering what the food is like. It’s a Pan Latin Steakhouse featuring menu items such as prime beef steak tartar; seafood arepas; ham croquettes; and grilled octopus. The food at the party was a little difficult to find. It was all passed h’ordeuvres, and I’m thinking all the guests were more hungry than the kitchen had planned for. We tried two things. This was good! The empanadas at Zengo are one of my favorites, so I am pleased that the empanadas here hold up to Richard Sandoval’s empanada standard. The second bite was a mini doughnut. Unfortunately I ate that faster than I was able to take a picture, whoops! I assure you though, it was a cute, sweet little treat. I’m sure you may be thinking about one more meal Toro Toro has got to offer here in DC– BRUNCH! Just like its sister restaurants, Toro Toro will have a $35 bottomless food & drink brunch every Saturday and Sunday. I’m not sure if they’ve started brunch yet, but you can bet I will be one of the first ones there once they do!! Check it out– you’ll enjoy it! !